Well, we’ve just gotten back from UMC – the Upper Murray Challenge. Have you ever done it? It is multisport event with marked course, 38km MTB, 25 km downriver kayaking and 25 km run over the top of mount Elisa. On Friday at 15:50, we jumped on the bike, rode from the office to the carpark, packed the bike in car with Maria already ready to drive. Going as fast as we could, by 4:05 we were driving out of the city. Every minute counts , so if you are stuck for 5 minutes or more in the city ,the drive afterwardswill take 20 minutes longer as the traffic gets worse and worse! 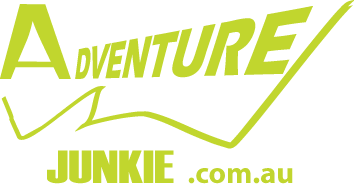 Fortunately, the drive was pretty quick and by 9:30 we were already in Caravan Park near Corryong and met up with the PeakAdventure team. We slept quite well, but not enough, as early next morning we had to get up, leave the running gear and hydration belt in the kayak to run a TA, and then rushed towards the start place. We got a timing chip, and once again checked the run leg map. It was not really needed ,though,as the course was marked quite well and it would have been rather difficult to go the wrong way. We brought a couple of gels and some water in a bladder. I don’t like bottles as I always seem to lose them during the mtb ride, and as a result get dehydrated. Not this time though – it was pouring rain all the way for 6 hours from start to finish. This made the mtb and run parts a bit slower (particularly the mtb), though conversely it made kayaking go a bit faster! The Mtb was very tough for me, as it involved quite a few very steep hills, a bit of a farm track, a bit of single track, and some 4wd trails. Remembering how hard it was last year to ride after first uphill, this time I started a bit slower. This made a big difference as I rode much better this year! Or perhaps it was because of my new bike, a Chiru Pulse – 29er endurance carbon machine made with only one purpose- to make it faster to the finish line! It really was amazing how well it cclimbed up the hills – there was no comparison to my old bike. It was quite a good ride for me, and I finished in about 14 minutes behind Jarad Kohlar, who took the lead immediately from the start and never looked back till the finish line. This was good result for me – out of running kayaking and mtb, I would put mtb as my worst. There were some good times riding with Brendan Hills all the way, passing him sometimes and letting him pass other times. The transition was quick, as Maria rushed me into an old Icon (a custom Kayak surf-ski). The Icon is very long, heavy and not a very stable kayak, but it has a few advantages for such a downriver paddle – the rudder is at the back, and the material the Icon is built from quite flexible and could withstand minor clashes with rocks at the bottom. Well, as mtb is the hardest bit for me, kayak probably is the most technical. I will not scare you – there were no big waves or rapids there, just a fast flowing river with a lots of sharp turns. As it is not about rapids or waves, the only danger in such a river are in those turns – if you got trapped under the trees in one of the corners, it is hard to get out from there, and it is even harder to get out with your kayak and paddle. That’s what you need to watch out for – sharp turns and avoiding getting too close to them. To do this, turn your kayak and paddle across the current towards the exit. For me it worked well, I managed to avoid all upstream currents that could catch your boat nose and turn it 180 degrees to lose precious seconds. It is not very technical paddle, though to paddle it you still need to have some experience. At the very least, do this paddle with some of your more experienced friends once before the race, if you don’t have flowing water experience. Anyways, I jumped out of the boat, and Maria met me at transition and rushed out again. I had only one gel during the ride and had none during the paddle. This was actually quite a bad idea, as I remember I started to lose energy by the end of the paddle. So this time I put down three gels at once and started my chase. I had no idea who was ahead and how many of them; the only thing I knew at the moment was that Luke “is not too far ahead” – I assume something around 10 to 15 minutes ahead, and also that “I doing really well”. I caught up one bloke during the flat section, though one team runner caught me up as well. I fell behind him by about 150m, then when the road gradually started to incline, I caught back up to him. At that moment I noticed someone else running about 200m meters up. Ok, I thought at that moment, I’ll be ahead of this guy before the top of the hill no doubt. Wrong. There are always different circumstances, different people, and they also race to win or at least to show their best. No matter how hard I pushed uphill, the guy was the same distance ahead. At some moment I even thought he is building a lead on me. I gave up the chase and started to work my own pace, enjoy trail running in the rain, consuming gels and drinking Shotz tablets. My GPS was set to show auto-lap every 1km, and at the beginning of the run it was plus/minus a few seconds around 4:30 per km, then it increased up to 6 minutes each during the incline, and the actual uphill took me 15 minutes for 1 km! That was sharp but this is what I enjoy the most! As a reward it is nice run along the ridgeline, with a few little hills up and down. Really great views from the ridge, but here we go – I can see back of that guy again! Great, let’s try to catch him! It went quite easy this time, as I run much faster downhill, and from now on it is all the way down the hill. I recognized him, it was Ian, he paddled past me on flat bit of river on grey K1. I rushed downwards, and I built up 1-2 minutes on Ian. There was also a few hundred meters across the paddock, I’ve looked back and can’t see him. Ok, now it seemed that there was no way he was going to catch me on a flat 5km bit. Wrong #2! I ran past cheering people at the crossroads, and started to run along sealed road. The pace increased again to 4:30 which was quite a positive sign. I felt excellent, but when I turned back, I could see Ian chasing me only 400m back. ‘This is no good!’ I thought, ‘I have to push next 4 km as hard as I can!’ Running was pretty good, and I reached the top of the second last hill, looked back and saw Ian about the same distance back as he was previously. ‘That’s great’, I thought, ‘Now I can run my own pace and enjoy the finish’. No such luck. He did not allow me to relax, and when I though it was all done, I looked back to see him to my horror 100m back. That’s when I had to run the “red light” again to the finish line. It was great surprise to know, that I’ve finished 3rd overall! Jarad Kohlar was 1st with an impressive 35 minute lead, Luke Haines second about 5 minutes ahead, and Ian Franzke just 20 seconds behind in forth. A few minutes later Maria finished the run. Another great win for team of three girls, Emma Francis, Emma Croser and Maria! It was a great event and good fun, and though I’m quite experienced, there was still plenty of new experiences. This is real race, and if you live somewhere not too far away, the race is certainly one to consider. It does not have many flags and banners, but what it doeshave is electronic timing, a tough course, and water safety marshals at the key points along the river. And this is all race have to have! Thanks to organizers for this event to happen, Maria for best support through transition ever, PeakAdventure for building up my kayaking skills though the year, Shotz for great race food and drinks, and my Chiru Pulse 29er for riding so effortlessly up all those steep uphills!